Yet another eventful year at the E-Base has passed. Last month, the E-Base program completed four years. In the company of our wonderful students and forest guards, we celebrated four years of learning and creating appreciation for wildernesses and the tigers that reside in them. This year saw our students improve their reading skills, explore the biodiversity around them in more depth and learn yoga. 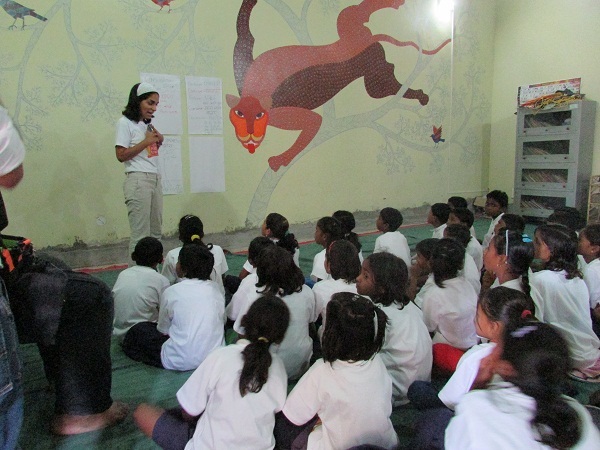 Here is a quick glimpse of our anniversary celebration in Pench. Inquiry and discovery are a huge part of the learning process at the E-Base. 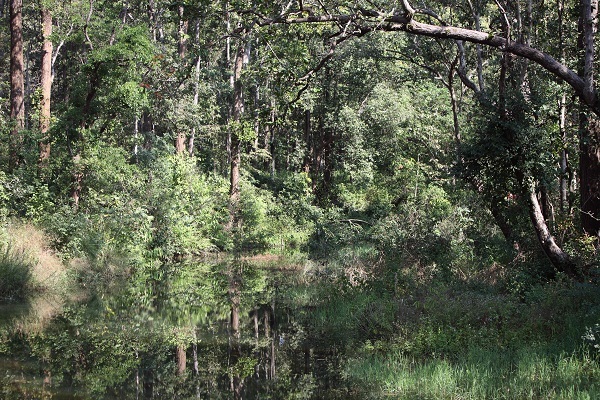 Our students are surrounded by one of central India’s most beautiful forests, which hold a large number of species within their innumerable, beautiful shades of green. Through this workshop on understanding biodiversity, we wished to bring to the notice of our students the biodiversity of Pench and the important purpose it serves. Beginning with a small challenge, the students named all the plant and animal species they could think of. A one minute challenge led to much excitement and long lists by every student. It is always comforting to see our students to know that our students are connected and aware of their surrounding. 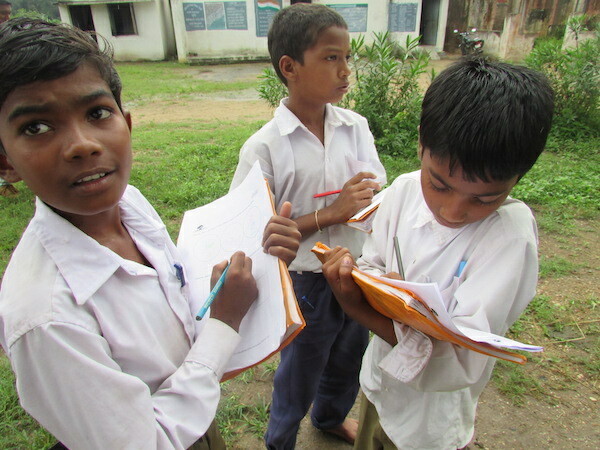 Using these long lists, Purvi and Sangita of our partner organization, Reniscience Education, elucidated the definition of biodiversity. It is exactly this- a whole set of species, big and small, short and long, marine or terrestrial that make up an ecosystem. Deconstructing the definition of Biodiversity. A modern day movement in support of the planet began in this month close to half a decade ago. Rachel Carson’s Silent Spring had awoken so many of the youth, and increasingly degraded air and surroundings lead to more people raising concern and springing into action. Environmental health was, for the first time, a part of tea time discussions of the common man and the agendas of the politicos. That was 1970. This is 2015. Despite increased awareness and more inclusive action to address environmental issues, we are, unfortunately, still in the midst of a climatic crisis, one that leaves us with a precarious future. One of the biggest reasons for this climatic turmoil is deforestation. However, it is not only the risks of climatic turmoil that we face due to deforestation, it is also a loss of our food and water security. Ahead of Earth Day on the 22nd of April, this workshop by Priyanka Pandit was about this very concern: loss of our green spaces. As part of Kokuyo Camlin’s ‘Camlin Kids Power’ initiative, Camlin promotes awareness of burning social issues amongst underprivileged children through mediums such as music and art. How glad we were to Priyanka and the folks from Camlin over to explain food chains, deforestation and food security with the help of a book and a guitar! To begin with, Priyanka took the students on a tour of the forest. A forest comprises of producers, consumers, decomposers and the likes. 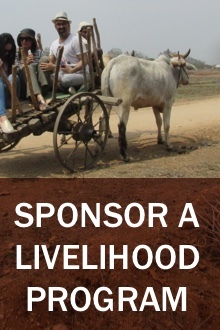 The consumers are herbivores and carnivores which are poles apart in every way, but still have one common link: the producer, our very own forest. 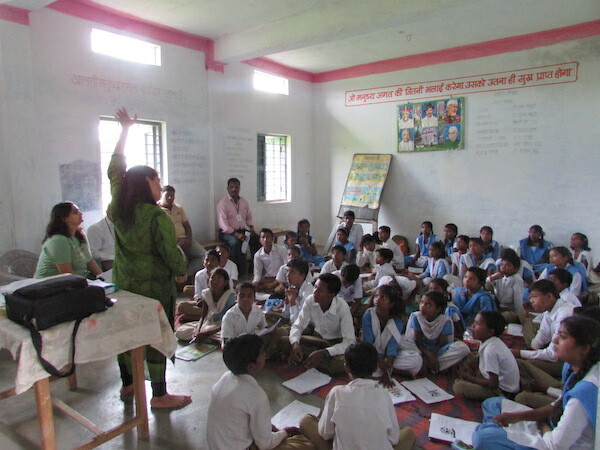 Priyanka explaining the significance of forests to the students. It gives us a lot of joy to share with you that the Pench E-Base program was featured in Canada’s ‘Natural Life’ magazine just last month. We have worked tenaciously over the last three years and we have begun seeing changes, big and small. Whether it is students making reading a habit, or them finding solutions to their waste in school, they are being transformed into conscious, independent youth of tomorrow. While we go on obliviously about our daily musings and chores, the world around us is teeming with life. It may not be at a macro level us primates are used to observing, but it happens at ground level, by a pond or under the canopy of a tree. Coupled with a lovely illustration, writes Julia Rothman in her delightful book ‘Nature Anatomy’, a little on how even a rotting log, though dead itself, is the source of much life. “A dead tree on the forest floor may not look like much, but the decomposing odd hosts a party of plant and animal life. Many kinds of insect larvae burrow into decaying wood to take shelter from the winter. Snail and snugs delight in the debris and fungi growing from rotting logs. Earthworms digest vast quantities of rotting or organic matter, leaving behind nutrient rich casts. Moist decomposing wood is a perfect nutrient nursery from which leeches, mosses, flowers, and even other trees can set root and thrive.” Such are the designs of nature and such is the unique circle of life. The forest looks still but teems with life. If this is the case of just a rotting log, what must the case of a prime deciduous forest be? 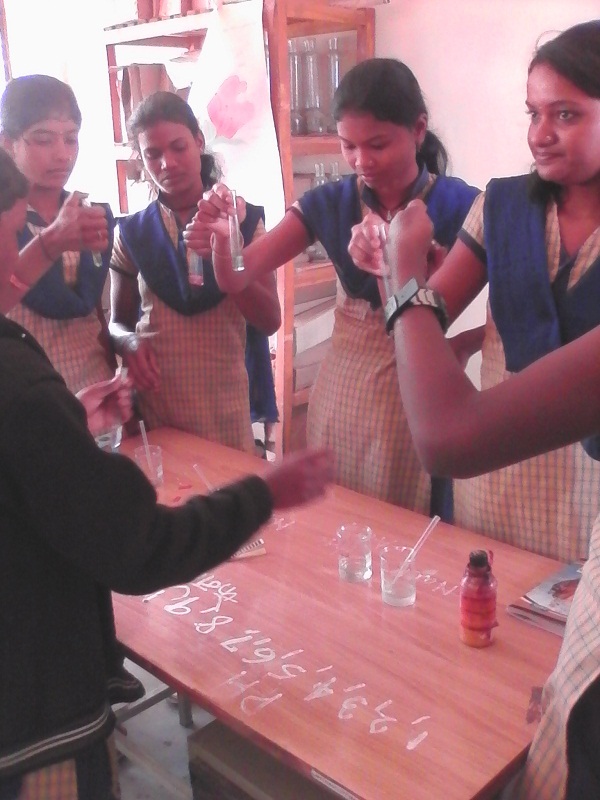 This is exactly what our students found out in this workshop with Reniscience Education. Everyday, we expel unnatural and harmful elements into our surroundings. In the beginning, they are nothing more than a mere inconvenience, however, over time, we experience the full effects of our actions. Whether it is littering in our immediate environment, creating a ruckus in the neighbourhood, contaminating our water bodies or simply putting into the atmosphere gases that do no good for us, we pollute in many ways. 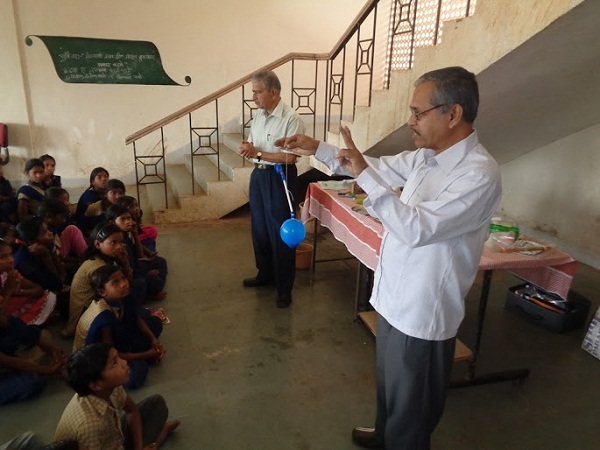 This month, the students learnt about the pollution around them in this workshop by Reniscience Education. Sangita Kapadia and Purvi Vora took the students out of the classrooms all around- into the village, by their lake, by the roads- to examine the impact through the pollution created in the village. 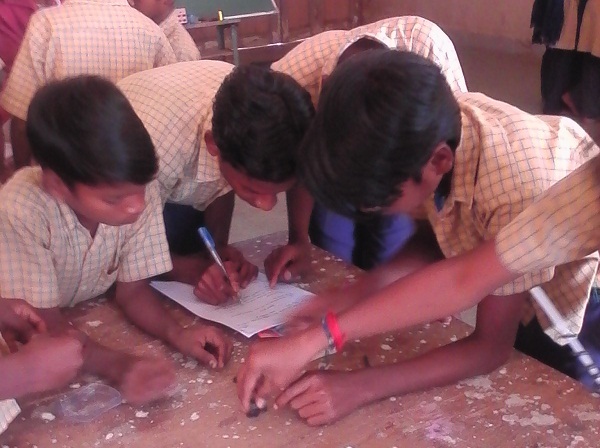 Through a pollution survey, the students were meant to identify the greatest sources of pollution and later, come up with solutions to best tackle the issue. 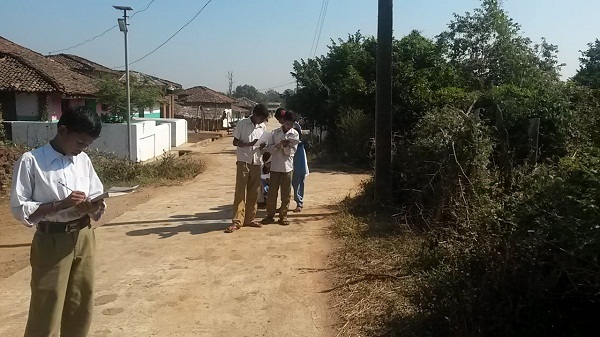 Students in the village of Kohka conducting the pollution survey.